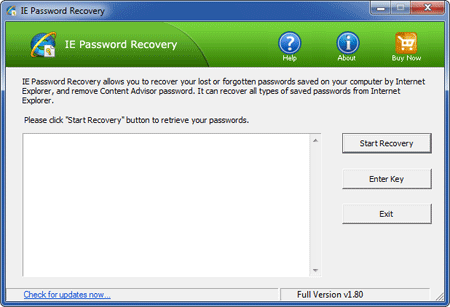 IE Password Recovery allows you to instantly recover passwords to Web sites saved in Microsoft Internet Explorer, as well as AutoComplete passwords. Passwords can be recovered even if you have deleted all Internet Explorer history files. This program can also remove Content Advisor passwords and works with Internet Explorer 6, 7, 8, 9, 10 and 11. Simply install the program, launch it and quickly recover all Internet Explorer saved passwords! Recover all types of Internet Explorer saved passwords. Remove forgotten Content Advisor password. Support Internet Explorer 6 - 11 and Microsoft Edge. Recover passwords saved in Microsoft Edge - A new Web browser introduced in Windows 10. New! A comprehensive solution for recovering all types of Internet Explorer saved passwords and removing IE Content Advisor password with just a single mouse click. When using Internet Explorer to surf the Internet, Internet Explorer allows you to save your login and password, then the login information will be automatically entered next time. What to do if you wish to recover the saved logins and passwords? There are many other situations you need IE Password Recovery program. Need to recover stored passwords from Internet Explorer. It is very convenient to save login passwords for internet sites such as forums, blogs or paysites to login quicker to those websites. That is, it is great until you can't remember the password anymore but would like to know it again. There are a lot of passwords (email password, twitter password, forum passwords, etc.) stored on your machine and you would like to recover and backup them in case of computer crash or system upgrade. You've forgotten your Internet Explorer Content Advisor password, then uninstall and reinstalled IE and the password still exists. You setup the Content Advisor in IE6 so your kids cannot access sites that they shouldn't be. Now you can't change the password as you couldn't recall the original password. "Very easy to use - Your program is an fast and easy-to-use solution that really does the job!" "A great piece of software. I will be recommending it to everyone. Keep up the good work." "I appreciate the program is so easy to use, and surprisingly recover a lot of passwords typed in some website long time before! " "Your program is a life saver. Thank you very much." Learn How can you recover Internet Explorer stored passwords easily with IE Password Recovery.